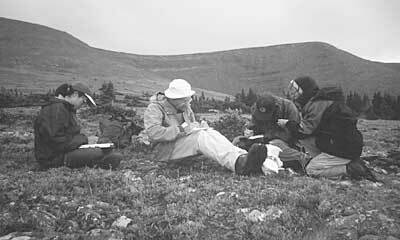 From August 12 to 16, 1996, a PIT project was held on the north slope of the Uinta Mountains. We had a crew consisting of 5 volunteers (we lost 2 on the trip in), 3 summer interns, a tourist from France, 5 FS employees, 3 horses, 2 mules, and 3 dogs. The dogs and horses were just not much help recording sites! This project contrasted greatly with our south-slope project two weeks earlier. We were just on the other side of the crest of the Uintas, and the vegetation differences made finding sites difficult at times. However, the fishing was much better. We experienced our usual afternoon lightning storms, which allowed us to study the underside of various tree stands while we huddled together. Half of the conversations on the project were spoken in French, as we had our French visitor Delphine Cullier and others who are gifted in the language, particularly volunteer Kent Parry. FS paraprofessional Nick Oprandy joined us as packer on the project with his horses, mules, and dogs. Thanks to him and the pack animals, we were able to have a camp stove and solar showers. Only 21 sites were recorded on this project, and we had to cover a lot more ground than usual to find them. Most sites were found up high in the alpine tundra. Several produced numerous tools, which was a surprise. More depressions were located, and although we believe many of them to be man-made, their functions remain mysterious. As usual, we camped right on a site, which several crews recorded once roasting pits were found next to tents. We were surprised that not a single site was located on Weyman Park, the primary focus of the survey. We spent a good portion of the time hiking up and down 1,000-foot slopes, so at least we got in shape, even if we couldn’t see any sites. The weather was generally better than on the other PIT projects held on the forest during summer 1996. Kent and Nick were there to keep us entertained. So, overall, it was a great project.